Only six months after his heart attack, writer and director Kevin Smith has went from "Fat Man on Batman" to "Thin Man on..." well, he'll figure it out. Kevin Smith is going to have to change the name of his superhero podcast, “Fatman on Batman”. Why you ask? Well guys, because he’s not the Fat Man anymore, folks! 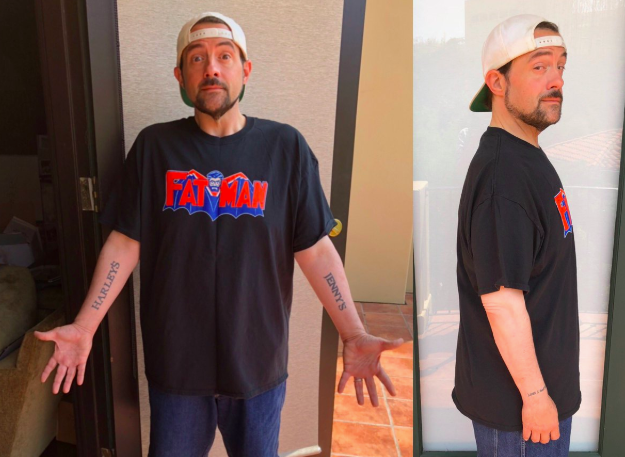 He’s going to have to find a character to discuss whose name rhymes with “Thin Man” because only six months after his heart attack, Kevin Smith lost a ridiculous 51 pounds and the photos he’s posted to Twitter and Instagram are absolutely stunning. This @weightwatchers Ambassador is thrilled to announce that I’VE LOST 51 POUNDS! Six months ago from right now, I was in the hospital recovering from a heart attack I’d had the night before. When I went to my Doctor a week later, she told me “The best thing you can do for yourself now is to lose 50 pounds.” Half a year later, I can report that I followed Doctor’s orders: I started at 256 and now I weigh 205. This is the lightest I’ve been since high school! My hope now is I can slowly lose another 10 with #weightwatchers and get down to my birth weight of 195! But for now, I’m ecstatic to have reached this chunky milestone! I wanna thank #pennjillette for his book #presto, @raycronise for getting me started with his potato famine, and the good folks at #weightwatchers for their app-based program that made it easy to keep track of and control my eating! And I also wanna thank my kid @harleyquinnsmith – the little vegan astronaut who explored this meatless/milkless galaxy ahead of me, leading by example. Since I never wanted to see the inside of a hospital ever again, I simply copied the Kid. So this wasn’t a diet: these results came from a total lifestyle change of eating solely plant-based foods (which is tough because I hate vegetables). But mostly, I wanna thank all of you as well – for the kind and encouraging words along the way. Never underestimate the power of positive feedback: you folks telling me I looked better or healthier helped me stick with it. An encouraging word can really make a difference in someone’s life and your compliments kept me going! And just look where I went! #KevinSmith #WWambassador #WWFreestyle #WWFamily #WWBros #weightlosstransformation #weightloss #WWCommunity #ad *People following the Weight Watchers program can expect to lose 1-2lbs per week. We want to congratulate Kevin Smith on his weight loss, and remember, if the director of “Yoga Hosers” can do it… maybe… you ga hosers can do it too! Be inspired by Smith! Thin Man on Lin Man(uel Miranda). That’s right, now that he’s thin, he might have to start talking about Lin Manuel Miranda now! What do you think of Kevin Smith’s transformation? Let us know in the comments or on Twitter at @WhatsTrending.